The first step when learning how to raise cattle is setting up your livestock’s shelter. Only after you have taken care of that are you ready to go buy some cattle. Cattle do not need a lot of shelter but you can’t just leave them out in the elements, especially during the colder winter months. Many people end up building very expensive barns or sheds when all you really need is a windbreak and that will be sufficient for younger as well as older cattle. The most important thing is to make sure the shelter you build can breathe. If you build some water tight super shelter your animals are going to have problems. Cattle give off a great deal of moisture both from sweating and voiding waste. If your structure doesn’t allow the moisture to escape it is going to cause a whole lot of health problems for your livestock. Whatever you build will double as a protection from the sun during the summer months. When you’re learning how to raise cattle you’ll find there is no hard fast rule when it comes to how much room you need to raise a single beef cow. How much pasture you need depends on what ground covering you have and how efficient it is. The general rule is you can raise a cow-calf pair on two acres. Cattle need a combination of protein, minerals, water, energy, and vitamins to grow properly. Feed can be separated into two different categories, concentrates and roughages. Concentrates are feeds low in fiber and high in nutrients which provide more energy than roughages. Roughages are feeds high in fiber. This includes grazing pasture, alfalfa, hay, grass and straw. Roughages are the least expensive part of your livestock’s diet and necessary for the vitamins and minerals it contains. Some concentrates are things like grains, cottonseed meal, wheat bran and soybean meal. The next thing you need to know when learning how to raise cattle is what breed to start with. Different breeds are acclimated to different regions in the US and in general, most any breed you choose from those that are acclimated to your area is fine to start with. When you’re selecting cattle you’ll want to find the one who is the healthiest based on a combination of muscle, style, balance, alertness and desirable breed characteristics. What breed is best for a farm in Oregon is going to be different from breeds used in farms in Pennsylvania for example. For yours and your cattle’s safety dehorn horned breeds of cattle. Castrate your males. This is in compliance with American markets when it comes to producing beef. Vaccinations should be considered for things like IBR, Black Leg and Brucellosis. Be sure to check with your veterinarian to see what other vaccinations are required for livestock in your area. To keep your cattle healthy they will need a combination of sunshine, fresh air, fresh water, and a variety of feeds. Wean calves by separating them from their mothers into another pen. 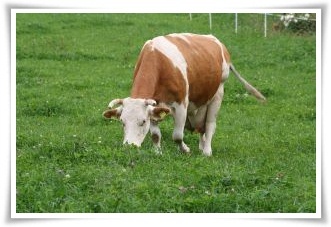 Once the calf is weaned from its mother the cow will stop producing milk. The first thing many people want to know when learning how to raise cattle is the time it takes to go from calf to butcher weight. Weight and age will vary from breed to breed but in general it takes about a year to go from calf to butcher weight. For many breeds butcher weight is about 1000 1200 pounds. If you start going too much over that weight you risk adding a lot of fat to your beef cattle. When you select your breed then you can get more detailed information as to how long it will take to get to butcher weight.